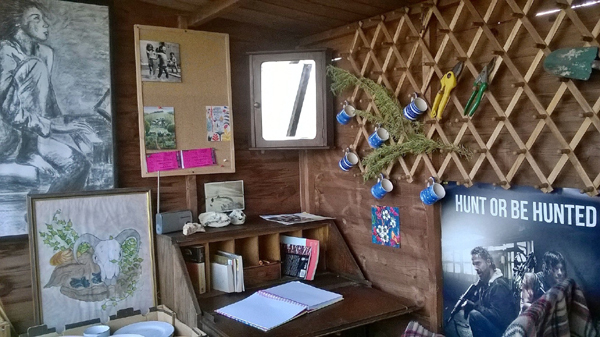 Now the weather is warm I can write in the potting shed, with the smell of tomatoes growing and gardening detritus cleared to create a small corner. It is good to leave the house and go somewhere that doesn’t have domestic chores nagging me or distractions of demoralising social media (look what you haven’t achieved, look how much everyone else is writing*). Although this is not a perfect writing shed, it is ramshackle and full of spiders, I still feel lucky to have my own place to write. Where I can just be quiet and think about my book and the odd poem that rises like a silver fish in a still, black pond. * I actually love to read other people’s writing success stories on facebook/twitter etc, the good news should be shared. I’m just being grumpy and self-critical. What a beautiful writing space! Am slipping once more into that demoralising social media land!